Just because the days are getting shorter doesn’t mean you can’t bring a little light into your life with our bright Vera Bradley colors and patterns! Find the perfect accessories to match your winter fashion this year, or search our collection for the perfect holiday gift! Our genuine Vera Bradley Small Foldable Roller will warm up your sense of style this season with the fun and considerate designs we are known for. Don’t bother with the old bulky profiles of the classic roller that dominates your closest space. 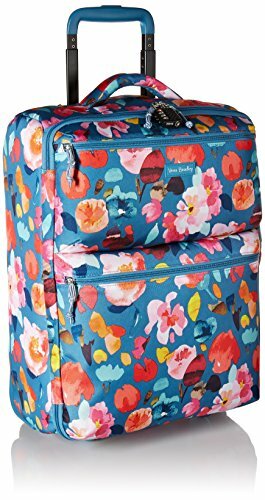 At Vera Bradley, we love making life easier from runway to arrival and the unique design of the Small Foldable Roller is even easier to store than the Large. With all the fully fledged features of your typical roller we’ve made our roller easy to store for when you aren’t on the go. No more wrestling the contents of your closet for space, this folding roller lays flat for easy storage on a shelf or tucked into a corner. Measuring 14 x 20 x 9 inches and weighing only 4.8 pounds for a lightweight travel roller which folds flat for convenient storage. Featuring a trolley handle, swivel wheels, one exterior zip pocket and ID window, two interior zip pockets, and compression straps to get you rolling right along. When you want to keep your feet on the ground use the clear plastic container and tuck the roller away until you are ready for your next adventure. Lighten Up fabrication is lightweight, durable and water-repellent to keep your essentials safe throughout your adventure. Sporty styling with functional details featuring a soft, brushed hand feel. Lightweight, durable and water repellent polyester in unique prints which coordinate with cotton prints and solids. At our very core, Vera Bradley is an innovative brand for women. We’ve always been inspired by the needs of real women, and our proudest moments have been when we can bring communities of women together through their shared love of beauty. We design our products with a deep understanding of our consumer. You are the focus of all we do.